Did you peeps know about this?! I hope not, because I would have expected you to share assoonas you found out, like I am doing now! I'm super excited about anything Muppets. Hubby proposed to me during Muppets From Space and Christmas isn't Christmas without watching The Muppet's Christmas Carol. Fact: if you do not like the Muppets, you are not a human being with a working heart. So this is a pretty good year for human beings, then-- there's a new Muppet movie, The Muppets, coming out November 23. 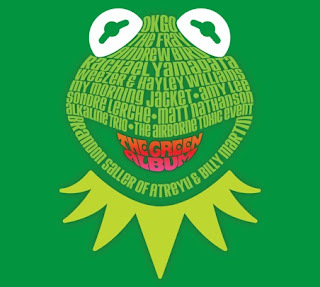 And on August 23, Disney will release Muppets: The Green Album, a collection of musicians offering covers of Muppet standards. My Morning Jacket, Andrew Bird, and Sondre Lerche are among those that contribute takes-- as are Weezer, who team up with Paramore's Hayley Williams (a pairing that assumedly makes at least one Pitchfork writer very, very happy) for a rendition of the classic Kermit-sung "Rainbow Connection". We have the tracklist for you below, as well as the trailer for The Muppets. 01 OK Go: "Muppet Show Theme"
02 Weezer and Paramore's Hayley Williams: "Rainbow Connection"
03 The Fray: "Mahna Mahna"
04 Alkaline Trio: "Moving Right Along"
05 My Morning Jacket: "Our World"
06 Amy Lee: "Halfway Down the Stairs"
07 Sondre Lerche: "Mr. Bassman"
08 The Airborne Toxic Event: "Wishing Song"
09 Atreyu's Brandon Saller and Good Charlotte's Billy Martin: "Night Life"
10 Andrew Bird: "Bein' Green"
11 Matt Nathanson: "I Hope That Something Better Comes Along"
12 Rachael Yamagata: "I'm Going to Go Back There Someday"
This is good news! And I must be human with a working heart because I love Muppets! I love the muppets but I do miss Jim Henson.